You can tell just by looking at this Samsung robot vacuum cleaner that it’s very stylish for a machine that will be taking care of a very mundane task around the home. The Samsung SR8825 is much like other products in this area of the market, but Samsung always strive to do things better than everyone else. Not only does it look beautiful in the home, but it’s fully functional will a clear LED screen and an hour and a half of run time. It doesn’t take long to charge either – only 2 hours – and the sensors that allow the machine to navigate around the home is supremely clever. It uses something called ‘Visionnary Mapping’ which allows it to steer cleverly, moving along edges quite nicely and knowing when a drop off is near. As with small vacuum cleaners of this size, the dust container is only a small 0.6 litres, but considering you don’t have to actually clean the rooms yourself, emptying a bin container more frequently shouldn’t make you out of breath! To give you an idea of how quickly it cleans, it should take just under 20 minutes to clean a 5 metre squared area. It was designed to vacuum pet hair with ease and it does so without any problems (tested with cat hair) using powerful brushes. It also picks up all types of dirt and dust. If the SR8825 needs to recharging while out ‘working’, it can return for a charge up and then remembers where it left off! Will automatically recharge itself (homes in on the power docking unit). Visionary Mapping for brilliant coverage of floors (uses a camera at 30 frames per second). 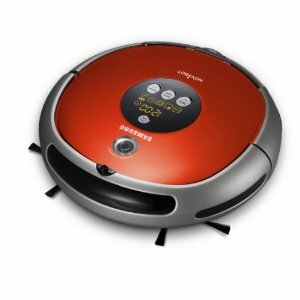 No need to have a work out when vacuum cleaning as the robot will take care of it for you. Reasonable sized dust container so you probably won’t need to empty all that often. Great usage time and you won’t have to wait too long for a recharge. Comes with extra sidebrush and filter. Expensive replacement parts in future? Shark NV680UKT – excellent attachments and amazing suction! Morphy Richards 732000 – cordless and simple to use! Vax Air Cordless Lift U85-ACLG-B – prepare for lift off! Vax Air Cordless (U86ALB) vacuum cleaner review – powerful, yet light! Better way to store accessories on a vacuum cleaner? Mobility problems, elderly or disabled?